TELEPHONE SYSTEMS – In Sync Systems Inc. In Sync Systems offers cutting-edge voice communication solutions to businesses and institutions of all sizes throughout the country. Your business relies on its ability to effectively communicate with customers and vendors. We help your company achieve the reliable and professional image of large businesses by installing quality systems from our premier equipment providers. 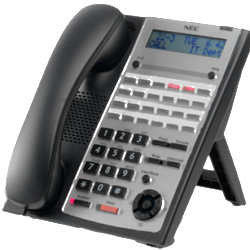 We offer NEC, Toshiba, Avaya, Nortel, Panasonic and others. In addition, In Sync helps your company utilize the many features of your new system by implementing call accounting, mobile workers, professional auto attendant recordings, smart paging, music/selling on hold, cell phone connect, and adding wireless headsets just to name a few. Allowing you to optimize your time and resources, and reduce expenses is In Sync System’s goal. Voicemail to E-mail – Have your voicemails automatically forwarded as a .wav file to your e-mail so you can address messages quicker. Remote Call Forwarding – Program your system to forward your calls to your cell phone when you’re away from your desk. Music on hold/Selling on Hold – Provide up-selling information and improving customer wait time. Professional Auto Attendant Recording – Provide customers with an enterprise-level greeting when they call your company. VoIP – Leverage your current data network to include voice, and eliminate telecom expenditures. Back Up Power & Power Protection – Guarantee your investment against power surges. Phone Bill Analysis – Allow In Sync Systems to review your current telecom/data monthly expenditures to help find less-expensive alternatives as well as removing fraudulent and needless charges. Smart Paging – Paging across all office sites regardless of location as well as offering customers the ability to locate a roaming employee without operator assistance. Cell Phone Connect – Allowing users’ office and mobile phone to act as one point of contact so calls to the office ring simultaneously on users’ mobile phones. Sound Masking/White Noise – Create a better and more-private working environment for employees by masking office noise and disruptions.